If your Montana vacation dreams include wilderness and wildlife then all your dreams will come true at Bear ‘N Crescent Moon. Surrounded by more than 2 acres of pines and aspens, this beautiful 3 bedroom log cabin has lots of privacy but is still just a short 1 mile away from Red Lodge city limits and just 7 miles from Red Lodge Mountain. 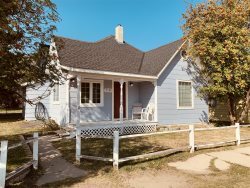 You are just minutes to The Carbon County Historical Society and Museum, The Carbon County Arts Guild and Museum, the Yellowstone Wildlife Sanctuary, numerous hiking trails, fishing, shopping, dining, bars, and so much more. Just South of your cabin you will find the most beautiful drive over the Beartooth Scenic Byway into Cooke City, Silvergate and Yellowstone National Park! When you’re ready for some shut-eye, there are 2 bedrooms on the main level. One has a Queen bed, the second bedroom has 2 twins. Upstairs you will find a third bedroom with 2 Queen Beds as well as a ¾ bath. Your Montana getaway and vacation dreams are sure to be memorable at Bear ‘N Crescent Moon. Currently there is no Internet Connection. You may use internet at the public library, The Coffee Factory Roasters (along with great coffee and goodies), or you may come to our office at 103 South Broadway. **There is a wood burning stove but not for guests' use. It is closed and for visual purposes only. There is gas forced air heat. Professional service; above average cleanliness; loved hot tub; private, yet convenient location; surroundings/lot beautiful; great price for this comfy cabin! The location is great. The cabin is beautiful. We had a wonderful week. Loved: Elk River Trail rides were exceptional. Wonderful family. Of course the mountains and scenery. The new playground is great - the kids were there at least 4 times. Montana Candy, lots of great restaurants. The accommodations were great, place was private and quiet, reasonable price, it was easy to book. Hiking was spectacular! Restaurants were very good ( Carbon Co. Steakhouse, Red Lodge Pizza Co. , Lapalmita. Best part of your stay: Hot tub, basket of towels, throw blankets, clean, cozy, well-stocked. Satisfied with customer service and taking care of our needs quickly! Beautiful location and accommodations. A wonderful place to stay! Well definitely stay here again if we come to Red Lodge. Loved: Honeys Cafe - lovely atmosphere and great food. The cabin was great! My family had a blast! We will definitely come back again. Very nice place, had baby black bear in yard yesterday morning. Very cool! As soon as we walked in we felt at home. We loved the nature and the secluded location! Very friendly on the phone...no hassles...easy to book! Loved this rental....easy drive to Yellowstone yet close to town and all the amenities! Loved Red Lodge Body Works - EXCELLENT MASSAGE. All shops were friendly! Loved all of Red Lodge! Thoroughly loved our stay and will recommend it to friends. Thanks!Local Places You Loved:4th of July parade, rafting on the Stillwater, Beartooth Pass, Old Piney Dell at Rock Creek - great for special occasions.